If you would like to listen to this post, click on the player below. or click here to download the mp3 file directly. 2000 years ago, history records the most amazing night. It was like most other nights for everybody else. But one family and heaven above would witness something special. Something that both have never experienced before. The family got a child they never planned for. Heaven saw the King of heaven in a manger. That baby would split history itself into two halves, heal lives, mend brokenness, spread peace, joy and hope. A hope that had a lasting effect even 2000 years after he was born. The baby was born. The miracle was real. God became man. We often think of that baby in the manger as quiet and peaceful. Nobody paints the baby Jesus as a crying baby or nursing with his mother or laughing with glee or even peacefully sleeping while his parents are exhausted after the travel and work. 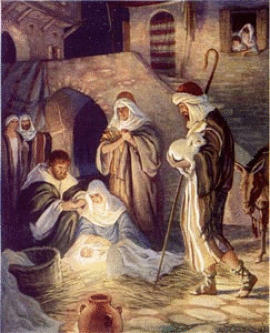 The baby in that manger was like any other baby. He was hungry. He wanted to be cuddled. And if he wanted to express his unhappiness, he did just the same thing every other baby does. He cried. Jesus was no different. But at the same time, he was so unique. The shepherds went to verify (Luke 2: 15) and they saw the prince of heaven clothed in swaddling clothes and cuddled by his mother.’God of heaven’ had become the ‘God with us’. For those who don’t understand why christians have to make so much noise about their faith, it is because of that one reason – The ‘God of heaven’ became the ‘God with us’. And we will continue to talk, sing, shout, preach, share the real reason for the season. The joy of heaven came down to us knowing we had no other way to reach home. Celebrating Christmas on December 25 will not make sense if we don’t celebrate it the rest of year as well. Thanks sAP! 🙂 God bless.. This is a wonderfully written account of the real reason for the joyous celebrations of the season. Jesus Christ, our savior, is truly the greatest gift for all mankind. Thank you, Ashish, for writing this.